It seems like just yesterday 4X and 12X tray loading CD-ROM's we're all that could be had, and at a hefty price to boot. Well in what seems like the blink of an eye, 24X, 36X, 48X and finally 72X drives have become common place. Kenwood was the first to bring 72X technology to the consumer and still holds this position without sign of letting go. 72X is fast, right? Is this just marketing hype or are we actually looking at a drive that creates a black hole every time your copy of Quake III boots up. 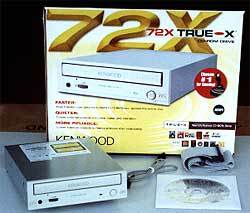 Only benchmarks will reveal the secrets behind the Kenwood 72X CD-ROM, so let the games begin! Cracking open the cardboard on our evaluation drive from Kenwood, the smell of new CD-ROM was eagerly welcomed. After a bit of unwrapping the drive made its way in to the bay of our HX-08 for some extensive testing. Our evaluation drive came with an audio adapter cable, IDE cable, and a special CD-ROM to show transfer and frame rates. The drive itself has got to be one of the nicest looking CD-ROM's out there. The tray bezel has some little dimples framing in the Kenwood logo. In addition, a headphone jack, volume wheel, drive activity light, and eject button are placed in the traditional locations. If there were ever an instance where the drive failed to open, an emergency release can be triggered by inserting a pin into a small hole above the volume wheel. Much like all Macintosh drives. The drive can be used in a horizontal or vertical mounting position. Little features like a geared drive mechanism, and padded drive recess make the drive very quiet opening and especially when closing. In comparison to a Sony 40X and a Yamaha CDR-W the drive opens fairly quickly, beating out the Sony.